A beautiful marigold that's also a great organic pest control. Nema-Gone is proven in trials to be effective in killing nematodes in the soil, and it's beautiful and fast-growing too. A 1/4 oz. packet (2,000 seeds) sows up to 500 square feet. Marigold, Nema-Gone is rated 4.3 out of 5 by 11. Rated 5 out of 5 by dorothy12 from great Marigold Second year that I purchased these seeds. These marigolds grow tall and bushy --great cover when tall lilies are over, lovely in the vegetable garden to keep pests away. 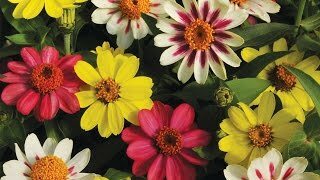 Easy to transplant to fill bare spots throughout the summer and early fall. Rated 1 out of 5 by garden momma from Weed Type Marigold Personally, I did not care for the Nema-Gone Marigold. These turned out more "weed" like than flowers. Very little blooms, unlike the picture, and grow extremely tall. This plant took over everything. Next year, I will go back to my "normal" marigolds. Rated 5 out of 5 by gigicats from big, vigorous, pretty and fragrant! I've become a big fan of these marigolds. I can't tell if they're doing anything to nematodes, but they certainly grow well in my garden and look lovely. I only planted a small amount of seeds from the packet, and it seems like all or most germinated. They've grown into very large plants, like shrubs, some two or three feet tall (as seen pictured with my cat.) I'm not entirely sure if all the seeds in the packet were actually for the same Nema-Gone type or not, since the blooms are all so varied (see picture). Some are yellow like the Burpee picture here, some are orange, and some are reddish. Nevertheless, they're all pretty and all growing well. They have nice long stems for bouquets, they smell sweet, and bees and butterflies seem to like them. Rated 5 out of 5 by junglegarden from Enormous! I tried this in my new garden. You really need some space for this monster. It produces what I would call a large shrub. Beautiful and hundreds of flowers,all the way into November. If I had more open space I would certainly plant again. Rated 1 out of 5 by GeeGee from Not one plant I have had no luck getting any of the seeds to actually grow into a mature plant. I direct sowed seeds in spring and not a single one sprouted. I then tried starting some indoors. A few sprouted, I hardened them off and ended up with 2 plants out of 8 to 10 pots. Plants died within 1 week. I am very disappointed as I know I have nematodes in my vegetable garden. Had to give it 1 star but would have given it no stars. Rated 5 out of 5 by MrKellso from Excellent Garden Companion! We don't have nematodes, but I was curious if it had any above-ground pest repelling qualities. I now regularly plant in corners and gaps in the vegetable garden, and my anecdotal conclusion is that it does repel pests. It's a beautiful marigold, but be warned that the plant grows quite large. Rated 5 out of 5 by Luka from Plant and run! I planted these marigolds for the nematode problem, I never imagined they would grow so big. I had a hedge across the front yard, then several toppeled over the retaining wall and formed a waterfall effect which was beautiful. I planted one plant at the bottom of our driveway and just recently cut it down. It was 8 ft wide, 6 ft long, and 4 ft high. All the neighbors couldn't believe that was just one plant. I will use them as a cover crop in my garden, they suppress weeds too!